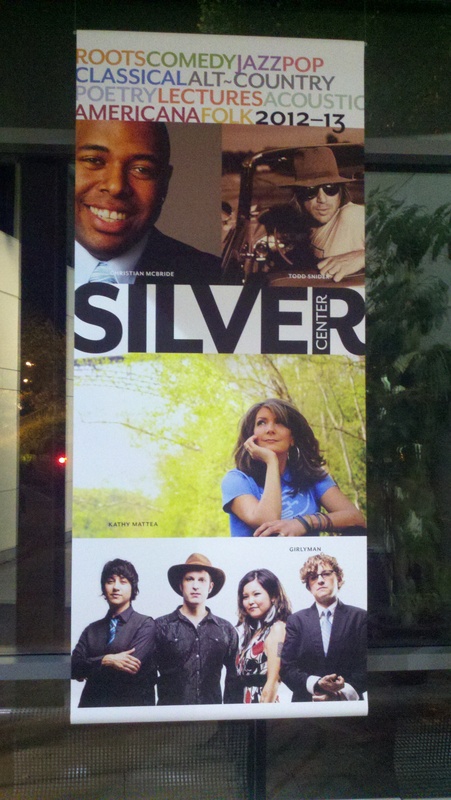 We made this banner to showcase the upcoming season at the Silver Center at Plymouth State University. They have it hung next to the main entrance of the performance hall to let people know about all the wonderful performances that will take place over the 2012-13 school year. There are over 70! In this case, we printed the performing arts banner on a film rather than vinyl. We have found that vinyl will tend to curl at the edges over a period of time- the industry calls it “canoeing” and it really looks bad. Since this banner will be up for almost a year, the film is a better choice since it will stay dead flat for years. We also printed this performing arts banner with UV inks, so it won’t fade with sun exposure. Our UV inks are good for several years in this kind of application. This entry was posted in Vinyl Banners and tagged window banners, window diplays, window graphics. Bookmark the permalink.